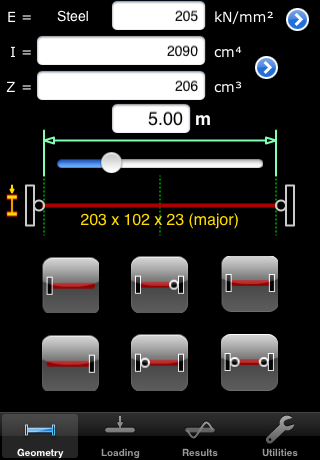 Benefits of this App over Space Truss L include automatic gravity loading, geometry groups, more advanced display capabilities, the ability to rotate and flip geometry, make selections by rubber-banding a box, and have member major axes pointing towards a third node, which allows for easier modelling of, e.g., roof purlins, rings, and other angled orientations. Include or exclude geometry from the analysis. Arrange by purpose, e.g. one group per floor. Arrange by section type, e.g. columns and beams. Represent extraneous structures by excluding groups from the analysis. Multiple copying of geometry for quick replication over a range of translations or rotations. Solid rendering in geometry view. Displays the structure with member cross-sections drawn to scale. Store and recall positions for viewing. Display on external screens (TV, projectors, etc., subject to hardware and OS support). • Added file transfer via iTunes. • Report content filtered by current group. • Added solid rendering to geometry views. • Added support for external monitors. • Nodes/members can be moved from one group to another. • Loads can be moved from one loadcase to another..
• Material density can be specified. • Added reflection of geometry. • Faster analysis and lower memory requirements for large structures. • Removed inappropriate pin button from geometry view.